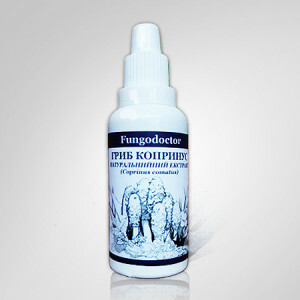 Extract of the fungus chaga (Inonotus obliquus), an auxiliary substance propylene glycol. Homogeneous transparent liquid of pronounced brown color with a weak specific odor. It is allowed to form a small amount of sludge at the bottom of the vial. The composition of the extract: contains a large number of biologically active substances, including water-soluble pigments, pterina and polysaccharides, detrimental to cancer cells, organic acids, lipids, steroid substances, tetracyclic terpenes, inhibit the development of tumors, flavonoids, cellulose, trace elements in the form of oxide compounds: copper, barium, zinc, calcium, iron, aluminum, silicon, magnesium, potassium, sodium (with potassium in 5-6 times more than sodium). It allows activating and restoring the inhibited enzymes of the system, improving metabolism in the body and in the brain tissues, stimulating the activity of the neurohumoral and nervous systems, enhancing the body's protective functions and its resistance to infectious diseases. 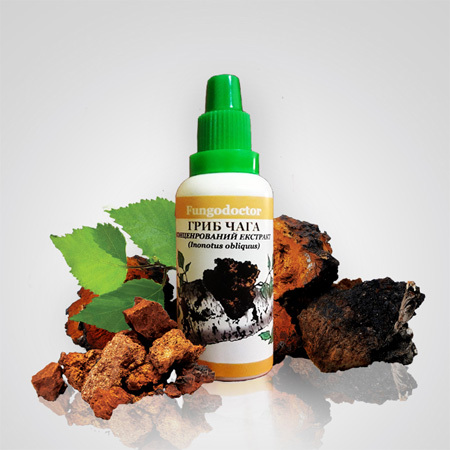 Regular use of chaga extract helps stimulate blood formation, increases the white blood cell count. Has anti-inflammatory effect, slows the growth of benign and malignant tumors, enhances the cytostatic activity of antitumor drugs. As a restorative substance in the recovery period after heavy and long illnesses, operations and radioactive effects. 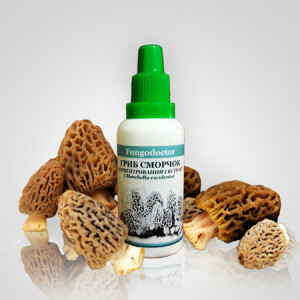 It has analgesic, wound healing, diuretic, antispasmodic, anti-inflammatory and antimicrobial action. 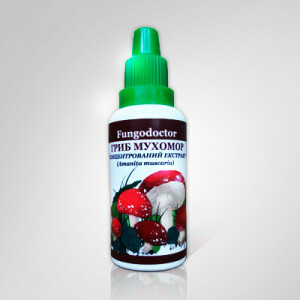 Helps relieve depressive and stressful conditions, positively affects the duration and quality of sleep, is recommended for insomnia, strengthens the nervous system, helps normalize the functioning of the digestive system and intestinal microflora, promotes scarring of the stomach and duodenal ulcers, is applicable in the fight against gastric gastritis and polyps. Has a beneficial effect on the state of the cardiovascular system in connection with the ability to lower arterial and venous pressure and to stabilize the pulse rate. Normalizes metabolic processes, including carbohydrate metabolism, is used to treat obesity. Used in treatment after insect bites, skin peeling, adolescent acne, skin injury and wound, burns, skin inflammation, leukoplakia, herpes, eczema, and psoriasis. It is recommended as an effective agent in the inflammatory processes of the oral mucosa and in dental diseases, such as: toothache, stomatitis, periodontitis, periodontitis. Contraindications: individual intolerance, children up to 3 years old, not to be used in the treatment of penicillin drugs and intravenous glucose, allergy to birch or any plant of the birch family, is not recommended for pregnant and lactating women.